Flashing Christmas lights beckoned us into Kaya. As compensation for the outside lighting, half the inside lights were turned off, although the fake candles dotting the tables helped us to read the menu. As we pondered the uninspired 60s acid-trip / 90s industrial rave decor, we tasted a Kahlua and milk (35 yuan) and a suspiciously weak Long Island Iced Tea (40 yuan). With Tsingtao at 30 yuan, we splurged on Coronas instead (30 yuan). Although empty, they have enough lime green and tan leather couches to seat 50. Three pool tables upstairs provide a necessary diversion. 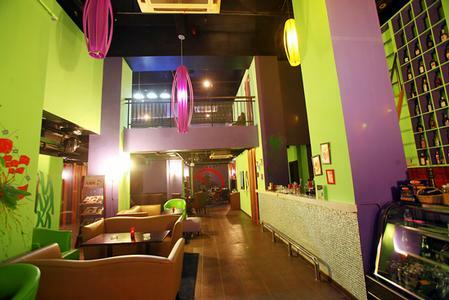 There is an awkward lack of cohesion to the design with graffiti art ornamenting the green and purple walls complemented by multi-colored bead curtains, exposed rafters and prints of flan, strawberry shortcake and udon noodles hanging on the walls. Plants potted in broken pots and empty bottles taking up room on the bar shelves of this new bar did nothing to increase its appeal.